This article suggests that the industry standard will soon be that any car involved in an accident on a "racing surface" will not be covered by insurance providers. It used to be that you could rely on "driver education" to get your claim through - however, since most insurers had a tough time with defining what is and isn't racing, they're just changing their policies to exclude "racing surfaces" - meaning race tracks. That might even cover closed course racing like autocrosses too. We might all want to discuss this and come up with some options for people who want to make sure their vehicle is covered at HPDE events - not to mention being covered for liability in terms of bodily injury to other people at the events, since most policies will not cover that either. It's one thing to total your car and not be covered. But to injure someone and not have coverage to pay for that person's medical bills would be a life changing event for most. Wouldn't the NASA participant policy cover any injuries that might occur? One of the best pieces of advice I've ever received regarding racing cars is, "Never race anything you're not willing to push over a cliff." Granted, HPDE is not racing but I think it's still good advice. That's why my daily driver is 1 year old and my track car is 12 years old and cost 1/4 as much. Then again, I see guys tracking Evos, Elises, Z06s, etc. and I say more power to them all. It's one thing to total your car and not be covered. But to injure someone and not have coverage to pay for that person's medical bills would be a life changing event for most. Would an umbrella policy cover another person's injuries if the collision was my fault? Bump for response to that question as well. Your insurance company will not pay a dime for anything if it took place on any sort of race track (according to there policy). I have racers insurance on both my race cars and they are covered while they are being transported to the race track and back and while being unloaded and loaded but as soon as i turn the ignition switch on they are no longer covered. Bodily injury can be a serious thing and people should think long and hard if they can afford to step on a track and take the risks that come with performance driving. I recently read my auto policy, what a shock. Formerly the exclusions were limited to the physical damage section of the policy and left room for coverage if participating in an autocross or HPDE type event. Now the exclusions in my policy have been expanded to include the Liability and medical payments section and refer to a racing surface not a race track. NASA has everyone sign a waiver when they enter the facility that basically says you agree not to sue anybody else. If somebody does sue you as a result of something that happened at that event, they will defend you. There is no coverage for you running into somebody/thing or vice versa. and we all know those 'waivers' aren't worth the paper they are printed on. If someone wanted to sick and attack dog lawyer on NASA or another person a 'good' lawyer would demolish that quick. actually I have heard that they are quite strong (otherwise our track weekend insurance would be much higher) - what cases have you read about where it was "demolished"? Its kind of funny to even hear those two words in the same sentence. "insurance" and "racing". About the only context I can see those two cohabitating is in regards to better quality parts and procedures giving the added "insurance" of reliability. 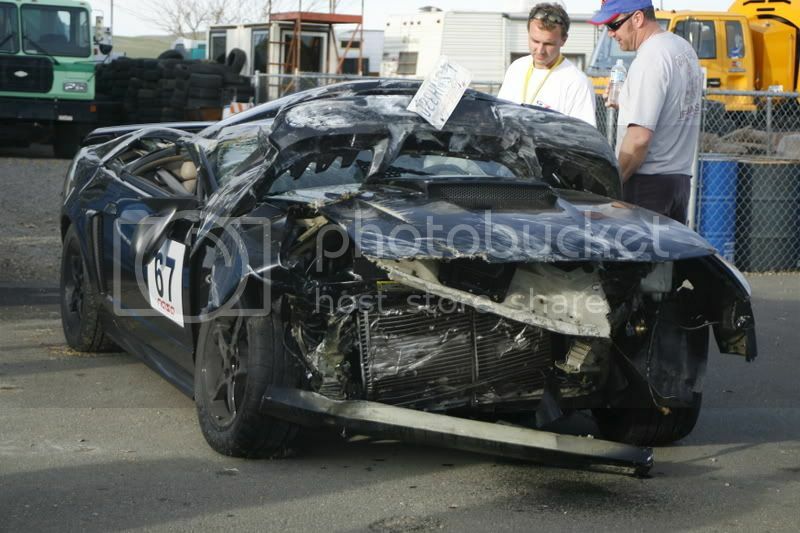 If any of you were at Thunderhill on March 10th you most likely will remember a Black Mustang in HPDE 4. You should remember the car because it was the one that ended up on its roof on the front straight. My insurance covered the accident. Sweet! What is your insurance company? I have 21st century. They covered the entire thing. Oh this aught to be good. (with all respect) DO TELL. PLease. 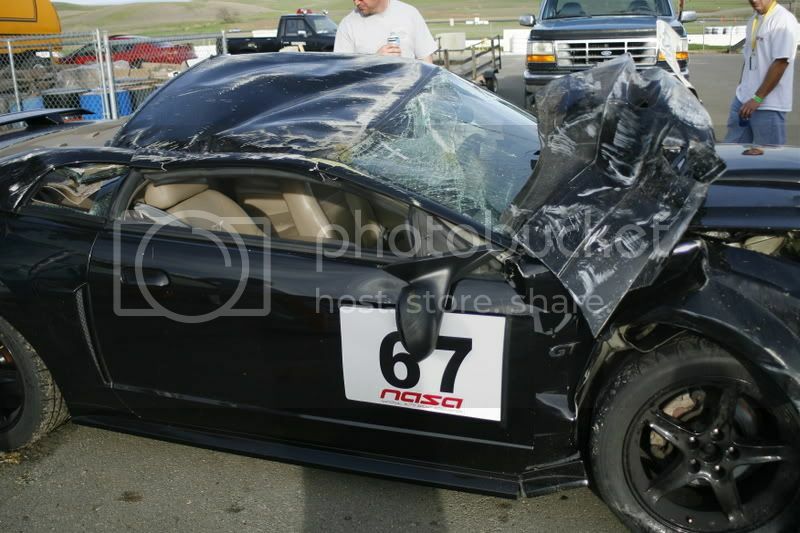 I was at Thunderhill in HPDE 4 on turn 15. I was on the right hand turn when the back end began to slip out as I hit the burm. The back tire went over the burm into the dirt and slid out a little further. The car finely grabbed traction and shot across the track into the tire wall, pit wall. It was all over after that. The car went flipping up in the air and ended up on the roof. The passengers side of the roof was completly flat and the drivers side was fine. The car had no roll bar or other safety equiptment. The passenger and I were both fine. I contacted my insurance company and told them the entire story. Since this is a driving school, they covered the whole thing. Damn. that is incredible. I am glad to hear you AND A PASSENGER made it out ok. Were you hurt at all? It looks like it was a nice car. you are lucky the insurance company is helping you out. No offense, but, let me know if you are going to part it out. That is a new interpertation of the NASA insurance policy that I haven't seen before. I assume when you say "they" you mean the insurance underwriter that NASA uses. So you believe that the underwriter will retain an attorney, at no expense to you, to represent you (as a NASA participant) against a claim, filed by another NASA participant against you, that arises from an incident at a NASA event. Say an on-track accident that leads to a serious injury. I would be very interested to hear how NASA officials view the limits of their insurance. Does Jerry or Ryan believe their policy extends any 3rd party protection from civil claim? Wrongful death or negligence for instance? I only play a lawyer on TV, so definitely check with the NASA officials for their interpretation. The passenger and I were both fine. In fact, the passenger raced the next day. He was luck to be short guy. I will not be parting the car out. I already have enough projects going on. I don't want to start another one by having to strip a car. Sorry, it was a very nice low milage car. I can appreciate not wanting another project. Its a shame about losing a clean car. Sorry, but you know how it is....just have to ask if parts are going to be available. thanks for the reply. I'm a total newbie. No HPDEs yet. I have a brand new mustang gt and intend to do HPDE. No real interest in Autocross. . . frankly it looks boring. . .like finding a parking spot on the weekend at Walmart [ouch I'm gonna get ostracized already!]. But one of my biggest hurdles is the insurance question. I've done some research, fwiw, and have found that some carry supplemental insurance for track days. Anybody got it? Anybody use Snellings Walters? I'll let you know what I find out from them. They're prices are less than what I already pay for full-GEICO coverage, or about $100/month for 4 drivers and a high deductible. Any info on this [or HPDE events around DC/MD/VA] would be truly appreciated!!! I was hoping you'd say that! I figured as much. . . Probably a good way to start out learning the car before HPDEs. So. . . on the insurance question, anything??? My 'track car' is just that, a track car only. So I don't have anything regarding insurance. As far as track DAYS, well the NASA-MA group is going to be at Sunmmit Pt in June, the weekend of the 23rd and 24th. Come on out and see what we/it's are all about. ... and welcome to the madness.